Floyd E. Norman is a veteran American animator who has worked in the animation industry for decades, more specifically from 1956 to 2000. 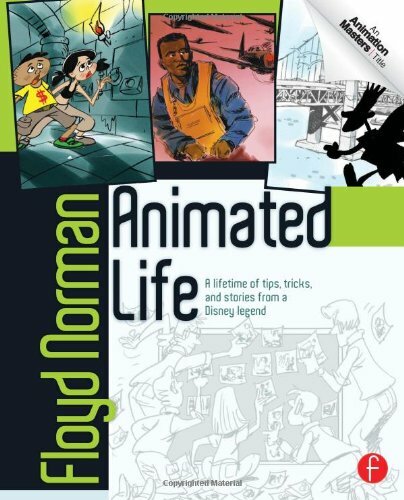 With this book Animated Life, he tells us the story about how it was like working for Disney as an animator. It's a story from the inside as he introduces us to all his coworkers and their jobs, talks about animation production, management, and reminisce about the good old days working with Walt Disney. It reads like a autobiography. There are lots of interesting stories, like how he bought Roy Disney's video camera and filmed the 1965 Watts Riots, quirks of different people, learning on the job. The other half of the book is on tips, tricks and other observations, mainly observations. It can be about filming, getting fired, storytelling, marketing, new animators on the job, racial politics, Steve Jobs, etc. The last part are some brief exercises on storytelling and idea generation. The book written in a very candid manner. You can tell he loves animation and it's like he's telling the stories as if they happened yesterday. Since Floyd Norman is pretty much a Disney guy -- he was named Disney Legend in 2007 -- much of the animation industry is seen from his eyes while working at Walt Disney Studios. The stories are mainly from the early days. He did work with Pixar until Monsters Inc, but the later stories aren't as detailed. It's a nice inspiring read for those who like to learn more about the animation industry.